Sidetracked by the discussion over the “fiscal cliff” and possibly a New Year’s hangover, it’s time to face 2013 in earnest. Is the yen doomed? Will the euro shine? What about Asian and emerging market currencies? Will gold continue its ascent? And the greenback, will it be in the red? While we were positive on the euro when it approached 1.18 versus the U.S. dollar in 2010, arguing the challenges are serious, but ought to be primarily expressed in the spreads of the Eurozone bond market. Then in the fall of 2011, we grew increasingly cautious because of the lack of process: just as it is difficult to value a company if one doesn�t know what management is up to, it�s difficult to value a currency if policy makers have no plan. In the spring of 2012, when we were most negative about the euro, we lamented the lack of process in a Financial Times column. European Central Bank (ECB) chief Mario Draghi appeared to agree with our concerns, imploring policy makers to define processes, set deadlines, hold people accountable. After his �do whatever it takes� speech in July 2012, he took it upon himself to impose a process on European policy makers in early August 1. We published a piece "Draghi�s genius" where we called for a bottom in the euro. We were inundated with negative feedback in the immediate aftermath of our analysis from professional and retail investors alike, confirming that were not following the herd, nor buying something that�s too expensive. While we liked commodity currencies in the first half of the year because of printing presses in larger economies working overtime, we grew a little cautious as the year moved on, partly because of valuations. Each commodity currency has its own set of dynamics, as well as their own Achilles heel: in the case of the Australian dollar, we had some concerns about its two tier domestic economy (not all of Australia was benefiting from the commodity boom), but also about the perceived slowdown in China. We studied the Chinese leadership transition with great interest; while 2012 may have been a year in transition, more on the dynamics as we see them play out below. Back in the U.S., we squandered another year to get the house in order. 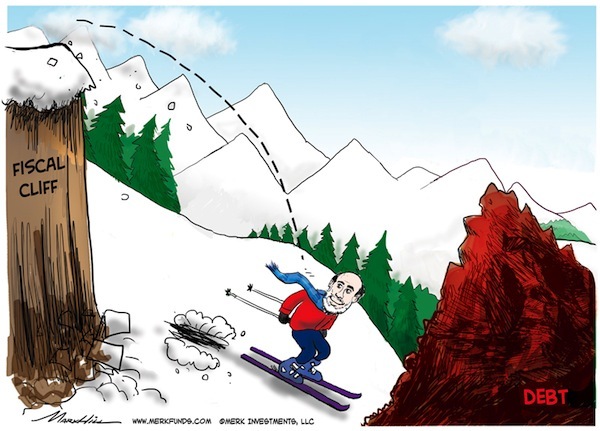 The fiscal cliff was a distraction; we need entitlement reform to make deficits sustainable. Europeans have no patent on kicking the can down the road. But unlike Europe, the U.S. has a current account deficit, making it more vulnerable should investors demand more compensation to finance U.S. deficits (that is, higher interest rates). Japan: the more dysfunctional the Japanese government has been, the less it could spend, the less pressure it could exert on the Bank of Japan. Add to that a current account surplus, and all this �bad news� was good news for the yen. Countries with a current account surplus don�t need inflows from abroad to finance government deficits; as a result, the absence of economic growth that keeps foreign investors away is of no detriment to the currency. Conversely, countries with current account deficits tend to pursue policies fostering economic growth to attract capital from abroad. However, in late 2012, we published a piece �Is the Yen Doomed?� What happened? Japan was about to have a strong government. More in the outlook below. Abe�s government will appoint the three top positions at the Bank of Japan, as the governor and both deputy governors retire. Recent appointees have already been more dovish. Japanese culture is said to prefer talk over action, but the time for dovish talk may finally be over (despite their dovish reputation, the Bank of Japan barely expanded its balance sheet since 2008; in many ways, of the major central banks, only the Reserve Bank of Australia has been more hawkish). Japan�s current account is sliding towards a deficit. That means, deficits will start to matter, eventually pushing up the cost of borrowing, making a 200%+ debt-to-GDP ratio unsustainable. Abe�s government is as determined as it is blind. Abe believes a major spending program is just what Japan needs. As far as the yen is concerned, Abe may be getting far more than he is bargaining for. But isn�t everyone negative on the yen already? Historically, it�s been most painful to short the yen; as such, many have not walked their talk. We expect some fierce rallies in the yen throughout the year. Having said that, the yen looks a lot like Nasdaq in 2000 to us. Not as far as technicals are concerned, but as far as the potential to fall without much reprieve. The British pound sterling. The Brits are getting a new governor at the Bank of England (BoE) in the summer, the current head of the Bank of Canada (BoC), Carney. One of the first speeches Carney gave after his appointment was made public was about nominal GDP targeting. Carney will have a chance to replace many of the current BoE board members. That�s the good news, as the old men�s club is in need of a makeover. The not-so-good news is for the sterling. British 10 year borrowing costs have just crossed above those of France. We�ll monitor this closely. As the head of the BoC, Carney was particularly apt at talking down the Loonie, the Canadian dollar, whenever it appeared to strengthen. If Macklem, his current deputy, is appointed, we may get a real hawk at the helm of the BoC. We are positive on the Loonie heading into 2013, but will monitor developments closely, as there are economic cross-currents that, for now, Canada appears to be handling very well. Staying with commodity currencies, we are cautiously optimistic on the Australian dollar (China better than expected; monetary policy more hawkish than priced in) and New Zealand dollar (more hawkish monetary policy on better than expected growth). We continue to stay away from the Brazilean real and leave it for masochistic speculators looking for excitement. We are positive on Norway�s currency (joining the above mentioned rock star, with greater volatility), yet cautious on Sweden�s (priced to perfection is not ideal when things are not perfect, even in Sweden). Korea, Malaysia, Taiwan: all positive, benefiting from both internal forces, but also beneficiaries of actions in other large economies. If we have to pick a favorite today, it would be Korea, but keep in mind that the Korean won is the most volatile of these currencies. Singapore: we continue to like the Singapore dollar. A year ago, we started using it as a substitute for the euro (rather than using the U.S. dollar as the safe haven currency). The currency may well lag the euro�s rise, but the lower risk profile of the currency makes it a potentially valuable component in a diversified basket of currencies. Gold. We expect the volatility in gold to be elevated in 2013, but consider it good news, as it keeps the momentum players at bay. We own gold not for the crisis of 2008, not for the potential contagion from Europe, but because there is too much debt in the world. We think inflation is likely a key component of how developed countries will try to deal with their massive debt burdens, even as cultural differences will make dynamics play out rather differently in different countries. Please see merkinvestments.com/gold for more in-depth discussion on our outlook on gold. Investors in the U.S. should fear growth. The spring of 2012 saw the bond market sell off rather sharply as a couple of economic indicators in a row came out positively. Bernanke wants to keep the cost of borrowing low, but can only control the yield curve so much. That�s why, in our assessment, he is emphasizing employment rather than inflation, in an effort to prevent a major sell-off in the bond market before the recovery is firmly established. Growth is dollar negative because the bond market would turn into a bear market: foreigners� love for U.S. Treasuries might wane, just as it historically often does during early and mid-phases of an economic upturn as the bond market is in a bear market. Good luck to Bernanke to raising rates in 15 minutes, as he promised he could do in a 60 Minutes interview. Sure he can, but because there�s so much leverage in the economy, any tightening would have an amplified effect. At best, we might get a rather volatile monetary policy. But we are promised by the Fed that this is not a concern for 2013. Both of these, however, suggest volatility will rise in the bond market. Remember what got the housing bubble to burst? An uptick in volatility. That�s because leveraged players, momentum players run for the hills when volatility picks up. And a lot of money has chased Treasuries, praised as the best investment for over two decades. We don�t need foreigners to sell their U.S. bonds for there to be a rude awakening in the bond market; we merely need a return to historic levels of volatility. Why is this relevant to a dollar discussion? Because a bond market selloff makes it more expensive for the U.S. to finance its deficits. Please see our recent analysis of the risks posed to the dollar by a bond market selloff for a more in-depth discussion on this topic. 1Speech by Mario Draghi, President of the European Central Bank at the Global Investment Conference in London 26 July 2012.